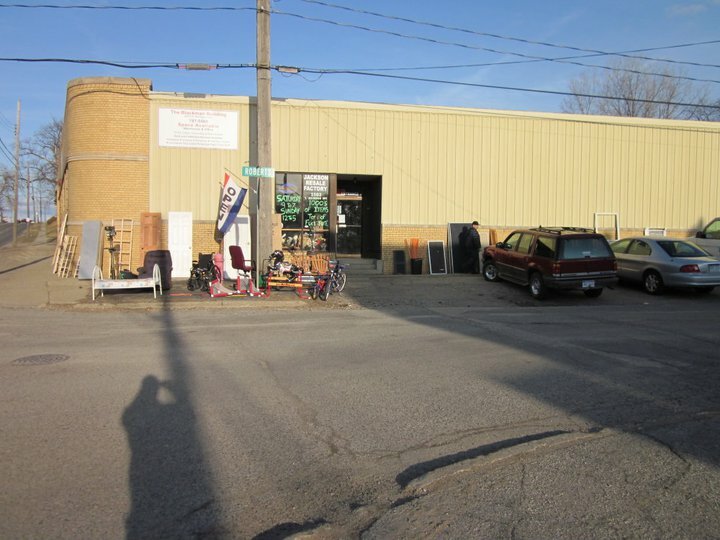 Kammy's Korner: The Incredible Jackson Resale Factory!! The Incredible Jackson Resale Factory!! Attention you Jacksonites!!! Wowzers, hubby and I stumbled upon a jackpot while out driving. "Out driving" isn't something we do, but I don't feel like explaining. haha. Let me tell you it is a HUMONGO building (old warehouse, factory, former pot smokin' joint, or something) run by these really cool dudes named Ryan, Ben, and Andy. The three amigos. Only they're gringos. They drive around Michigan, Ohio, Indiana... and pick up truck loads of "STUFF" - mostly furniture - unload it all in their big ole' building and sell it to we the people for pretty good deals! They're willing to dicker up or down. Dickering is what I'm all about. Unfortunately we just had our car, and had to fit two kids in as well so I only managed to snag a crazy vintage end table and some kiddy chairs. HOWEVER, I went back with fellow junker Marie and this time I was smart-o and brought the pick up! Well kids, when I left the house, my hubby gave me strict orders NOT to" go crazy". Well, by his standards.... I WENT CRAZY. I couldn't HELP IT!!!! I GOT SUCH AMAZING DEALS!!!!!!!! And Ryan and his sidekick Melvin were so awesome strapping it all down for me... I just kept finding more stuff! What's a girl to do?? I'm sorry Honey, I'm sorry, I"m sorry. I'll make you Kraft Mac n' Cheese every night for supper if you want!!! Please forgive me! Andy and Ben strappin' her tight for the haul down I 94. How awesome is this?!! I see something beautimous in it's future! Stay tuned to see what this turns into!! My kind of place! Love all your goodies, can't wait to see the makeovers.